The band FREEZING BLOOD was founded in Poland on 2012. 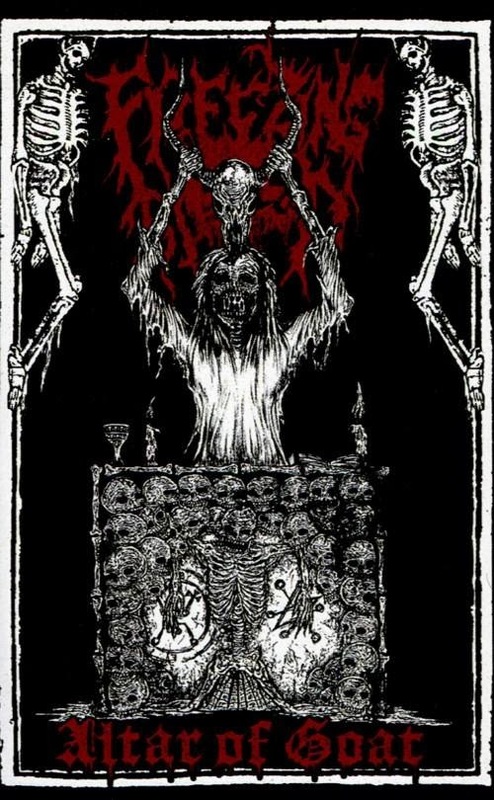 Alter of Goat that has been released from label Fallen Temple is a putrid example of how a raw black metal band should sound. The demo holds a chaotic, twisted sound that is enough to make one feels the aura of raw Black Metal. FREEZING BLOOD is an unrighteous congregation of the members of some other Polish extreme metal bands like Mordhell, Moloch Letalis, Martwa Aura, Distress etc. The foundation of each track is supported by bestial riffs featuring motif that binds the listeners through chaotic repetition. With just a few notes, but all has more sense for primitive noise, the fully-and semi-destructive instruments are met and expanded with the inhuman vocal of Morbid Priest of Cadaverous Gospel. The accompanying guitar makes the tracks a bit typical, but definitely gives a substructure to make the sound strong. It emphasizes not in the foreground, and therefore has an enriching and obviously not annoying in the first place. Same goes for the drumming which predominantly occupies both slow-paced and fast-paced tempos. The songs are filled with raucous, latent desperate growls excellent for such music. It rounds off the overall impression and ensures that Alter of Goat is consistently a solid matter. FREEZING BLOOD offers vilest sound with their music, although makes no reinvention of the wheel, nevertheless is nice to listen to. Presumably, this band just needs a little more time to deliver a full length. This would be very desirable for the fanatics of black metal music.